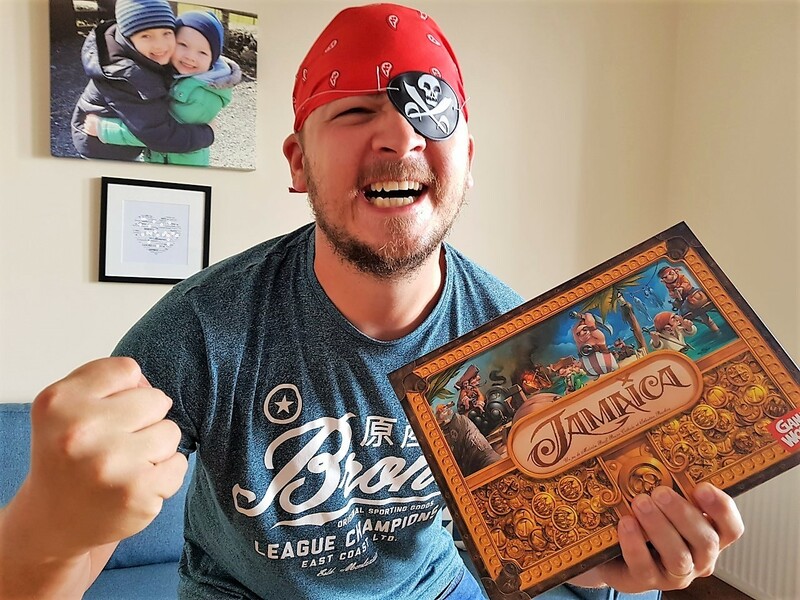 We were introduced to Jamaica the other week, having played and thoroughly enjoyed our cousin’s copy. It was exciting being sent our own to review as we were eager to add it to our collection. Some games really stand out for entertainment value and this was one of those games. As you can tell from how my husband is dressed he is taking the game VERY seriously! In summary Jamaica is a pirate sailing adventure. First back to port gets awarded the most coins. But that doesn’t mean you’re an automatic winner. It’s down to how many gold coins you hold at the end. As you battle your way around the board, hopefully picking up some decent treasure on your travels too! All of which is putting yourself in a good position to win. Although deciding to stop for treasure is risky. Not all treasure is worth taking! Some cards minus gold from your total. If you have one of these its worth trying to win a battle and passing it on to the losing player. It’s such a good feeling getting rid of one of those cards! If you get a special card (one that isn’t bonus or minus gold) you need to play this straight away. It can give you a beneficial bonus to your game. Such as an extra space in your hold or 2 additional battle points. If another player beats you in battle though they can pinch one of these or if they prefer the contents of one of your hold spaces. To improve your chances in battle you can allocate any cannons you have towards your roll. But if someone gets the explosion picture then its an instant win regardless of your overall battle score. The game is played as two turns each, a morning and a night. So in this case you would do something in the morning x 5 and then x 1 in the night, whether that’s movement around the board or picking up food or gold depending on what your card says. I managed to win one of our games and made a point of making progress. I didn’t focus on treasure I just looked for the green arrow on my cards and tried to advance as quick as possible. It made a big difference as I had a significant lead on the other players. That lead equated to 20 extra points as 3 of the remaining players had yet to cross the red line so had 5 gold coins each deducted from their total. Plus, I had my 15 gold coins for being on the finishing line. Since then I have been defeated! If your unlucky with dice rolls or don’t seem to get the playing cards you want, then your little sailing ship might be slow to make progress. The card you decide to play is hidden and revealed at the same time as the other players. This can be problematic. For example, a decision I made didn’t end well because of the actions of another player. It does add to the complexity of the game. If you would like to win you own copy of Jamaica please fill out the form below by the 19th of August. Make sure you check out what other competitions I have live.